tissues such as rheumatoid arthritis, rheumatism, osteoporosis, lupus and others. Dr. Wodecki earned his medical degree from Nicolus Copernicus Medical Academy in Cracow, Poland, after completing his undergraduate study at New York University at Old Westbury, New York. He completed his residency in Internal Medicine at St. Vincent’s Medical Center, Staten Island, New York, where he earned Intern of the Year Award and served as Chief Medical Resident. He later completed his fellowship in Rheumatology at Long Island Jewish Medical Center, New Hyde Park, New York. Dr. Wodecki is board certified in both Internal Medicine and Rheumatology and has participated in many national research studies in multiple fields of rheumatology and chronic pain. He is a member of the American College of Rheumatology, American College of Physicians, North Carolina Rheumatology Association, American Medical Association and Iredell County Medical Society. 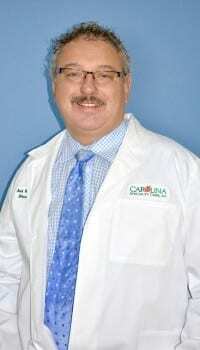 Dr. Wodecki has privileges at Davis Regional Medical Center and consulting privilages at Iredell Memorial Hospital.